A plaque commemorates the men and boys of Eden who volunteered to man the United States Army Small Ships which supplied American and Australian servicemen fighting the Japanese during World War Two. 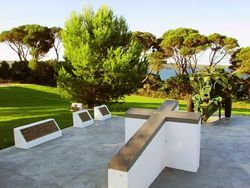 The plaque is also dedicated to other Australians who served on the small ships during the Second World War. 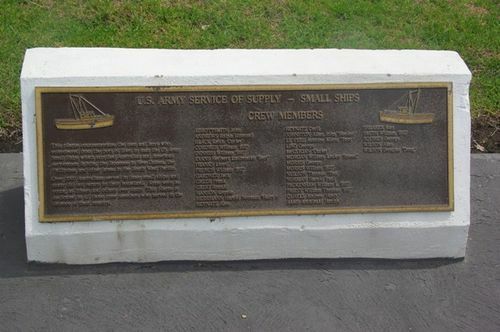 This plaque commemorates the men and boys who volunteered from the port of Eden to man the US army Small Ships which supplied Australian and American servicemen fighting the Japanese in New Guinea, the Philippines and other areas in the South West Pacific. Over 3000 Australians served in these small ships and many did not return to their homeland. Some were as young as fifteen and others over sixty. This plaque is dedicated to all those crew members who served in the defence of their country.